“JUSTIN BIEBER: NEVER SAY NEVER“, which opened nationwide on February 11th to critical acclaim, earned $30 million in its initial weekend and earned an A+ Cinemascore from women (an A overall). 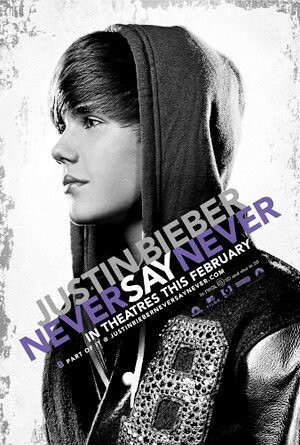 The new fan cut will have a running time of 115 minutes and will be available in 3D theaters across the U.S. and Canada for one-weekend starting Friday Feb 25th, 2011.
http://www.justinbieberneversaynever.com/ Check out the official site for Justin Bieber: Never Say Never.com! The movie is also going to hit in 3D for this weekend. There is almost 40 minutes of new footage in the movie. As he began the editing process several months ago, and upon realizing the significant amount of great footage he had obtained, director Jon M.Chu began to develop with the studio an idea for a second, and more fan centric, edition of the movie. While promoting the film’s initial release, he spend dozens of hours of Twitter and Facebook engaging with fans to learn more about what they were anxious to see. Some scenes contained in the new cut include: more of Justin’s friends and hometown life, new songs and performances, and special footage shot at fan premiere’s across the country. Posted in movie and tagged Bieber, Justin Bieber, Movies. Bookmark the permalink.